Amazingly, in 14 seconds, the sun provides all the energy that the earth uses in one day. Most of the energy striking the Earth is not utilized, however, more and more people are are building passive solar houses that harness the sun’s energy. This owner-built passive solar house is in Washington State. This passive solar house is a submission from owner-builder Joel Chalupny in Goldendale, Washington. 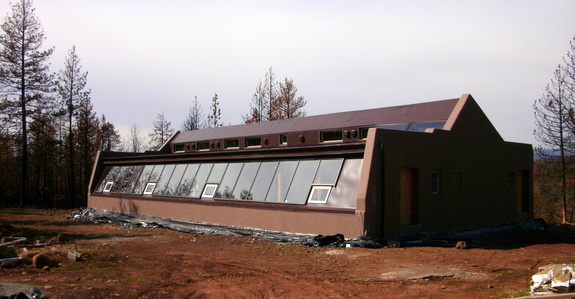 He is documenting his experience building this lovely passive solar house over at Sustainablesolarhome.com. The house is built on a shallow east-west orientation, with solar glazing (windows) facing the south. The house is built on an east – west axis, with the windows facing the south. This house interacts with nature and the environment, including the sun, rain, earth and wind, in order to provide a truly self-sustaining and independent living environment. The smooth curves of the southwestern style house is beautiful, as are the reclaimed wood finishes throughout the home. And the satisfaction I get from building my own eco-friendly home is beyond words. The home is built in typical passive solar with clerestory windows to allow the sun the warm the back of the 3000 square foot house. A view of the passive solar house from the south-east. This home is all about energy efficiency. 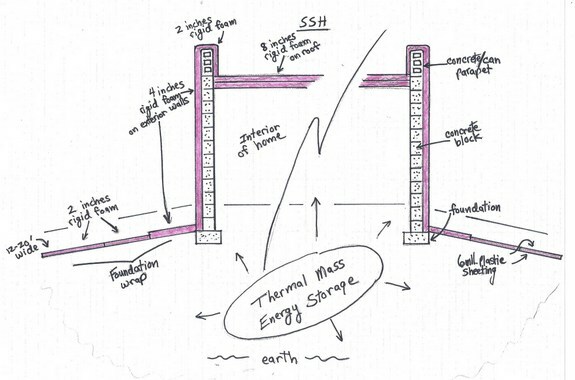 My home uses southern glass, high thermal mass and high insulation, while utilizing PAHS principles, in order to heat and cool itself with zero utilities or fuel used. The side view of the house that features the clerestory windows. 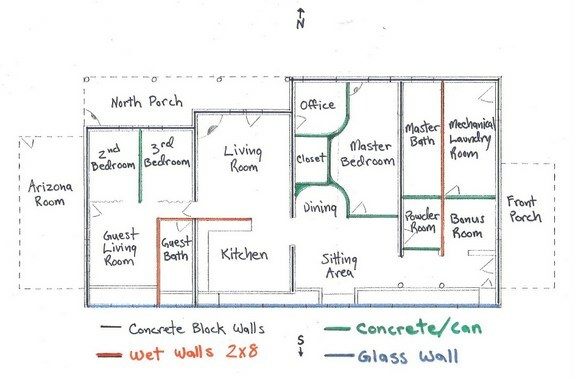 Utilization of passive solar principles is the cornerstone of this home – called an SSH (sustainable solar home). Here are a few: We use the sun to heat the building, for solar hot water, solar electric, solar cooking, solar daylighting, solar clothes drying, and interior greenhouse gardening. This entire home was designed and build around passive solar utilization. 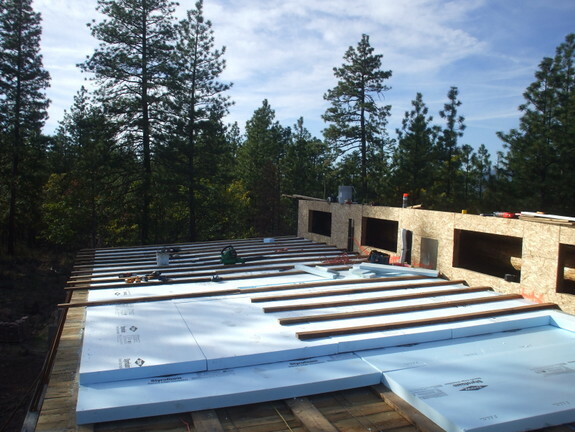 Thick 4″ foam forms part of the insulated building envelope. Way to go Joel! He utilized all the basics of passive solar. 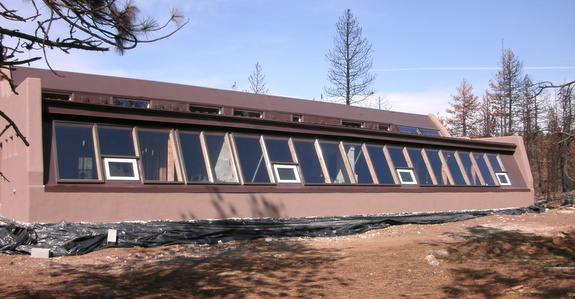 Efficient passive solar building consists of a few interrelated concepts: thermal mass (in the concrete and adobe), southern facing glazing (windows that face the south – both to collect the heat from the winter sun, as well as shield the higher rotating summer sun) as well as an insulated envelope to keep the house warm in the winter and cool in the summer. 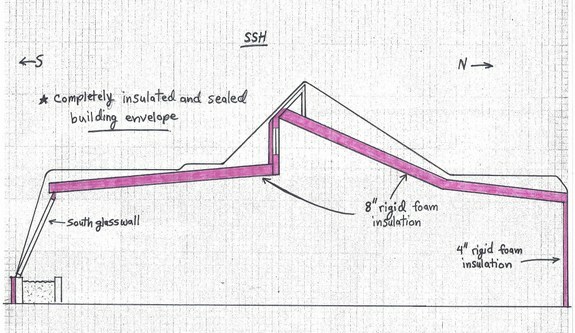 This diagram shows how the passive solar house stores the sun’s solar heat in the winter. At the present time, owner-builder Joel Chalupny going on three years of building time and putting finishing touches on his home. He’s done a lot of great DIY projects and blogging about the process. Here’s a taste of the information that he has at this website. He also built the venting system near the top of the house.